Albert Edward Benefield was born in Wanganui, New Zealand in 1875, second son of Nurseryman William Benefield and his wife Esther. He married Alice Conroy in 1898 and they had one child, a daughter, in 1904 whom they named Muriel. By 1908, Albert was proprietor of the local fruiterer’s shop (part of his father’s horticultural ’empire’) and spent much time travelling the local area representing his father’s business interests. However, a tragic accident cut short his life at the young age of just 33 years old. Newspaper reports of the accident and the subsequent inquest the following day provide a narrative of the sad events. On the evening of 30 April 1908, Albert was visiting his brother Arthur in Aramoho and, having heard the 9pm train from Palmerston North cross the nearby railway bridge Albert telephoned his wife to let her know that he was coming home by train, and then went to the Aramoho station. He was in good health and spirits. He boarded the train and put his bicycle in the guards van. George Foster, who was guard of the train, knew Albert personally and when he went through the carriages to collect the tickets he noted that Albert Benefield was in the centre of one of the three carriages comprising the train, but as the train approached the station Albert went out onto the platform between the carriages, where he stood with another passenger, Arthur Pitcher, an engine driver on the Public Works line. About forty or fifty yards from the station Mr Pitcher’s attention was distracted for a second or two and on looking round again he was horrified to see Albert disappearing between the carriages on the outer side of the platform. One hand was grasping the stanchion and the other was trying to get a hold. Arthur Pitcher grabbed hold of Albert’s wrist and clung to it for a moment or two, but Albert’s foot must then either have caught in a sleeper or got under a wheel, for he was snatched away and Pitcher was forced to let go, the unfortunate man dropping on to the rail beneath the carriage wheels. 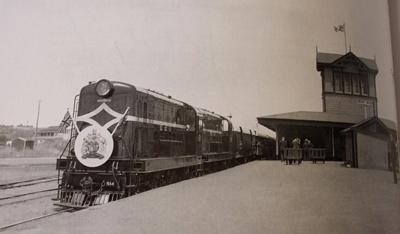 Mr Pitcher, as an engine driver, then disconnected the hose on the Westinghouse brake and turned off the tap on the front carriage, resulting in brake in the rear part of the train being applied leaving the front part free. This would prevent the guard from operating the brake on the whole train. At the same time, Guard Foster heard a scream and felt a bump and tried applying the brake but the train, which should have pulled up under ordinary circumstances, carried on right into the the station (because of Pitchers actions). The result was that the unfortunate young man under the train was dragged along for a distance of about 17 yards before the engine pulled up at the station. 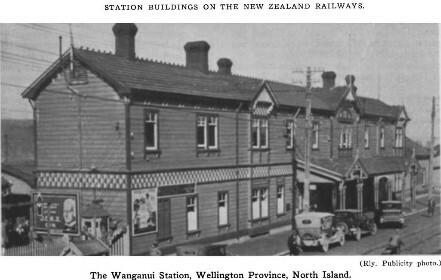 The station foreman at Wanganui, Peter Barkman, was informed of the incident as soon as the train arrived. He and others then searched the area and found Albert lying across the points leading to the goods shed. Albert’s left leg was almost cut off below the knee while there was a deep gash in the calf of his right leg. The left arm was almost severed above the elbow, and there was a deep cut to his head, besides other injuries. Mr Barkman had the body moved to the porter’s room where he applied tourniquets to stop the bleeding, assisted by Sergeant Bourke and Constable Thompson from the local police. The alarm having been given, as quickly as possible the unconscious and horribly mutilated body was conveyed to the porter’s room. Dr Anderson, who had been communicated with, was quickly on the scene and had the injured man conveyed to the hospital where he was admitted at around 9.40pm. There were no signs that the body had been dragged. Thomas Fergus, the house surgeon at Wanganui Hospital, took the decision to amputate Albert’s left leg at the knee and the arm above the elbow. However, the injuries were too severe, and Albert died from shock at around 12.10am. How Albert came to fall between the carriages as he did is not known, but the inquest surmised that he must have been crossing from one carriage to another, and somehow tripped and fell under the rails. It’s likely that his head was struck by the gas feed, a pipe of which was broken by the impact, and finally the trailing wheel of the van passed right over his body. At the inquest the following day the jury, without retiring, returned a verdict that Albert was accidentally killed by falling off a railway train. Albert was well-known and highly respected, and the news of his untimely death caused quite a shock to the community. He was 33 years old when he died and left a wife and 4-year-old daughter.